maintaining healthy joints, especially in patients who have problems with motion, which may be consequence: a significant burden on the joints (during exercise or overweight), mechanical injury, sedentary lifestyle. The product is also indicated for the elderly. Yra keletas gyvenime situacijų, kai mūsų sąnariai reikia papildomos apsaugos. Palyginti su mūsų senu produktu Joint Protex, Joint Protex FORTE palaiko sąnarių sveikatai dideliu kiekiu veikliųjų medžiagų, todėl rekomenduojame jį pirmiausia tiems, kuriems reikia papildomos apsaugos. There are some situations in life when our joints need extra protection. As compared to our old product Joint ProteX, Joint ProteX FORTE supports the health of joints in increased amounts of active ingredients, so we recommend it primarily for those who need extra protection. Bones constituting the skeleton of the human body are connected to each other by joints. Movement of bones in relation to each other, that is motion itself, is enabled by the joints with the help of surrounding muscles. At the end of the bones constituting joints a cartilage can be found, which on the one hand helps the joint to move with the least possible friction, while on the other hand fulfils a protective function as well. Therefore, its integrity is very important. Cartilages are surrounded by the so-called articular capsule and synovial fluid found in the articular capsule, which, acting like a “lubricant”, promotes the frictionless motion of the joints. The health of our joints is affected by many things. As we age, joints which are permanently at work, for example those that carry our body mass such as the hips and knees, wear out of course. This wearing out process may be further accelerated by a sedentary way of life, or by carrying extra weight, and should also be watched carefully in the case of ace sports, hard physical work, as well as hereditary disposition, principally in ladies. 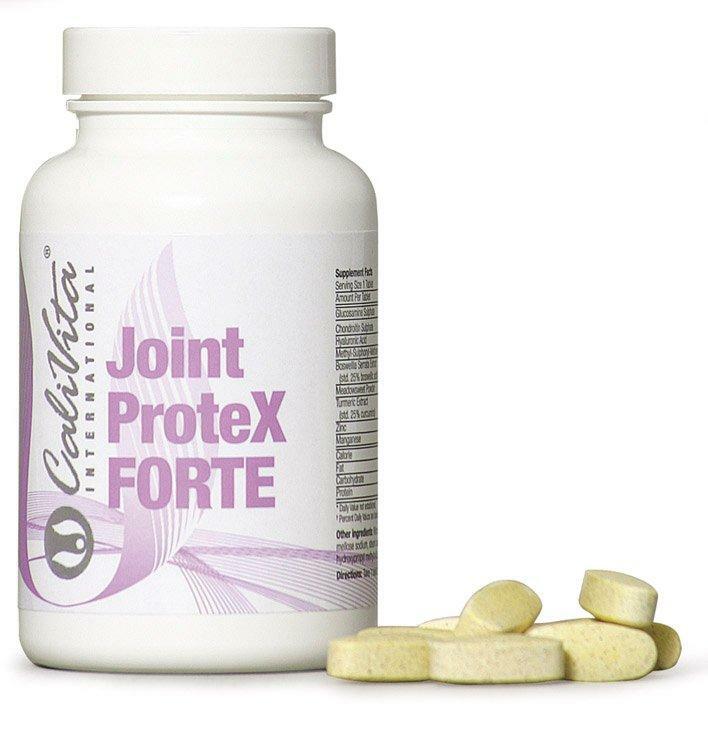 The active ingredients of Joint ProteX FORTE may contribute to the protection of our articular health. Glucosamine participates in building up and maintaining the main structural elements of cartilage, so it plays an important role in preserving the integrity and regeneration of joints (mainly that of cartilages). Chondroitin, synergically collaborating with glucosamine, acting like a lubricant for the joints, may support the functioning of joints. Hyaluronic acid has a similar role to chondroitin and as a natural moisturizer it guarantees the viscosity of articular liquids and reduces friction on the cartilage surface. Methyl Sulfonyl Methane, also known as “msm” is a commonly used component in joint protecting formulas. It helps preserve the healthy structure of cartilages. Moreover, the product contains beneficial plant extracts as well as zinc and manganese. For persons sensitive to sea shellfish, its application should be avoided.